ABBOTSFORD – Great weather and an even better cause welcomed dozens of duffers to the UFV Employee Charity Golf Tournament at Abbotsford’s Fraserglen Golf Course on Saturday, May 9. 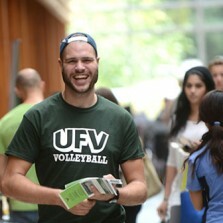 Over its 35-year history, the event has become a seasonal favourite for UFV employees. Leading the charge once again was UFV’s Faculty and Staff Association and Human Resources department. With Manulife signed on as a generous partner, and golfers donating, the event raised $3,414 for the Faculty and Staff Bursary, which helps students returning to UFV who demonstrate financial need. The bursary’s impact was relayed by two former recipients, both of whom expressed sincere appreciation during short speeches following the tournament. This year’s great organizing team included: Debbie Dyck, Kartar Thandi, and Sheila Reimer. Other vital volunteers included retiree Grace Gould and putting contest coordinator David Leis. President Vicki Grieve offered a warm, supportive speech on behalf of the FSA. Prize sponsors included: Bargreen Ellingson; Dafco Filtration Group; FraserGlen Golf Course; Gerry Enns Contracting; Guillevin International; Honeywell; IPAC Chemicals Ltd.; Lordco; J&W Electric; Shepell; Sodexo; The Co-operator’s Vandeven Financial Solutions; Tikal Construction; UFV Alumni Association; UFV Bookstore; and University Relations, Advancement.